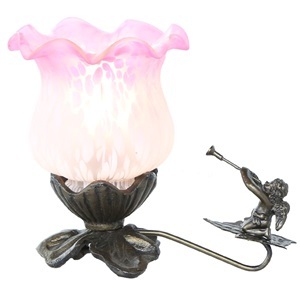 Mini Trumpeting Cherub Lily memory lamp with choice of shade colors. 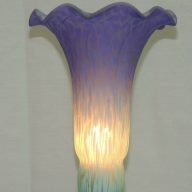 This beautiful Mini Trumpeting Cherub Tulip Lily memory lamp has a striking hand blown and hand painted shade. You have a multiple choice of shade colors. The detail on the trumpeting cherub kneeling on the leaf is absolutely spectacular. The entire base on this accent lamp, including the cherub, is metal and hand finished in brushed dark and light bronze, which rests upon legs with a wonderful leaf design. 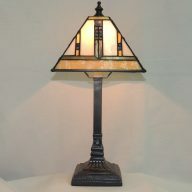 At 6″ high, this unique lamp can fit just about anywhere and makes a fine gift in memory of a loved one, or to celebrate any memorable event. 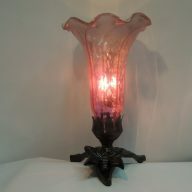 A beautifully enchanting gift of light and wonderful option in lieu of flowers.